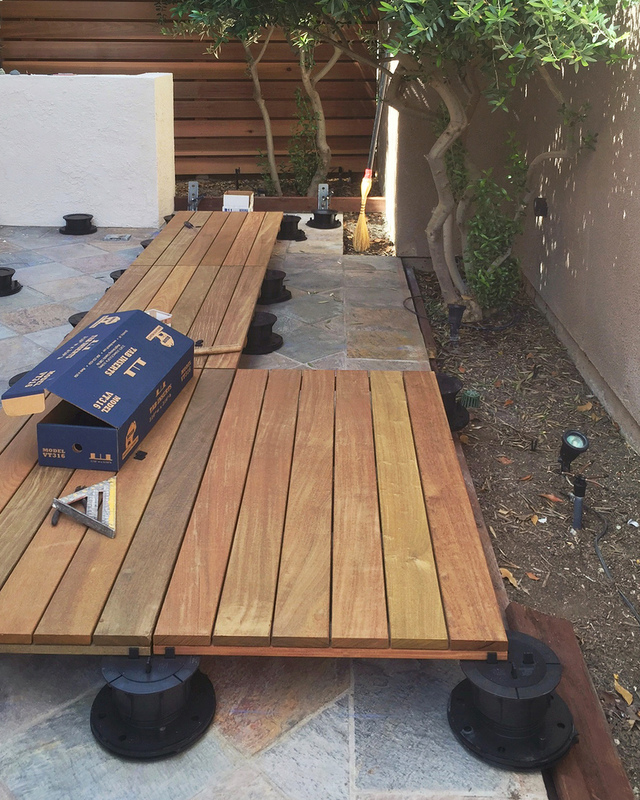 The past few weeks have seen a bit of progress at our site in Mission Viejo, where an existing exterior space is being transformed into an outdoor kitchen and living room, starting with new wood fencing and decking. Beautiful clear-grade cedar enhances the streetscape at both front and rear yards with clean, linear design. The double-sided construction allows for a solid privacy wall at the location of the new outdoor bbq and kitchen area, an extension of the interior space accessed from the modern kitchen completed by MYD last year. A new ipe deck invites users to the gathering space beyond, the change in grade also serving as a means to architecturally delineate space. The system used at this project is a modular series of 24" by 48" structural ipe panels supported by a grid of adjustable pedestals (bison ip). This approach allows for clean installation, enabling access to existing utilities while maintaining a continuous appearance, with no visible hardware, consistent finishes and minimal construction impact. Providing a structural and level surface over the hardscape and landscape, the solid ipe will easily carry the weight of a concrete and steel fire pit to be installed over the new deck. More updates to come as progress continues at the project site in Mission Viejo.